Here at A Park View Hotel and Hamiltons Restaurant we offer a range of bespoke gift vouchers in Wolverhampton. They deserve a divine gift, whatever the celebration. who brings his dedication and passion to your dining pleasures. Crisp white table clothes, Unlimited Tea & Coffee Perfection on a Slate, a fabulous atmosphere complemented by great service. 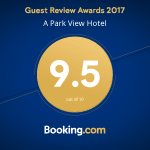 A luxury stay in one of A Park View Hotel’s Executive suites, with a park view including a sumptuous breakfast. You may personalise the voucher with a message. Vouchers can be brought directly from reception or over the phone, please allow 48 hours for the voucher to be made before collection. Vouchers are only valid for 6 months from the date of purchase. When booking to redeem your voucher please give the voucher code. You must bring your voucher when you come to redeem it.